Klik! Size Lib.Net is a set of components to provide resolution independency to your .Net Windows Forms applications. Klik! 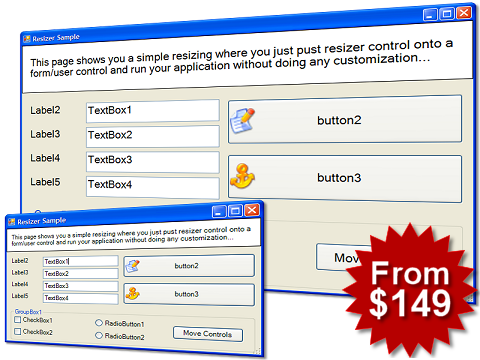 Resizer component in this package allows you to keep your controls font/size proportion whenever your forms are resized. This basic functionality allows you to resize your controls size, font and images whenever the form is resized thus allows you to keep the controls in your Forms/UserControls proportional no matter the change in it's size. Klik! SizePos component tracks your form's Size and Position values thus allows them to be opened at the same size and location at each start. Another nice feature of it, which completes our resolution independent paradigm, is the ability of tracking screen resolution changes. This is starting from your development environment and whenever your application is run in another resolution, all of your forms will be automatically scaled to adjust to that new resolution. Klik! SizeLib.Net is offered in 2 dlls which each targets different .Net framework versions as v1.1 and v2.0 so there is no need to buy separate products for different framework versions and both dlls are also optimized for their target environments. The best way to see what our products does is to download and evaluate a trial version. Please click here to get the trial version of Klik! SizeLib.Net v3.0.8 for Windows Forms. A Murphy rule says that no application can be bugfree! :) Please click here to get the latest update pack for Klik! SizeLib.Net v3.0.8 for Windows Forms.